If you are prepping for your perfect day, here are a few inspiration galleries for our brides-to-be! One of the exciting things about wearing that white dress is it is a blank palette for you to design whatever look best suits your (and your nervous fiancee’s) wedding style. Soft and romantic is just as perfect as bold if that is what fits your personal style. Fall dresses commonly have a strap or sleeve design element, which may influence your hair design inspiration. Also, with the change of seasons comes a change in the availability of certain flowers; check on the flowers you many want to adorn your hair, but an elegant answer could be pretty baby’s breath tucked in a braid. Accessories are great in the cooler temperature, especially with long loose waves. Fall hair color radiates in natural light! Perk up your color’s natural richness or go dramatic to offset your simple style. It may take months to achieve a change in your hair color. Set your trial appointment well in advance to discuss the course of action for your hair color. 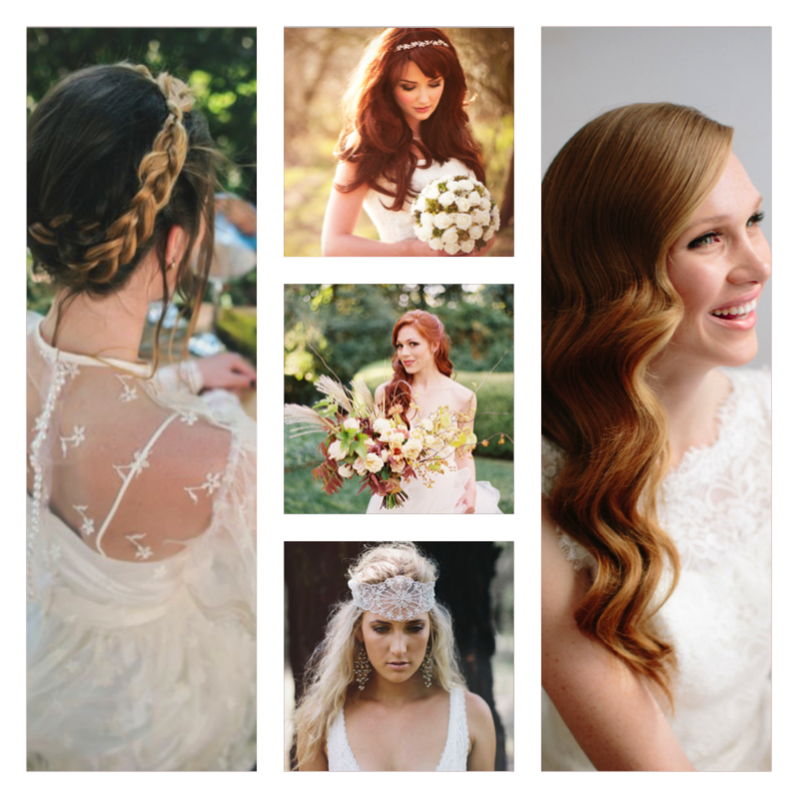 Bring headpiece ideas with you to your hair trial so your stylist can help determine how to achieve your look. Crimson stylists are Hot Heads and SoCap Extension experts! Our makeup is inspired by the seasons, so with autumn as the backdrop, colors that evoke foliage (and most likely your decor) are stunning. When choosing your makeup look, imagine where your photos will be taken and choose the look that will set off your features and the atmosphere. For the autumn wedding, you are not in danger of sweating your face off, so dramatic looks are not out of the question. We love the bold lip! Fall wedding want oranges and deep reds with blue undertones. Fall faces are well shadowed, lined and highlighted and autumn eyes and cheeks reflect the cooler breezes. The look is demure and pretty, naturally elegant in a heightened, well contoured way. Fall faces are stunning with a peach or pink undertones and colorful eye. Neutral lips with a natural palette sets off your skin tone and beauty. Alter your eyebrows: shade, shape and level of drama. If you are not used to wearing a dramatic lip but want to achieve that look for your wedding, test run the color and a few brands before committing for your wedding, maybe for your bachelorette weekend. Scarlett Johanssen is always a great reference! 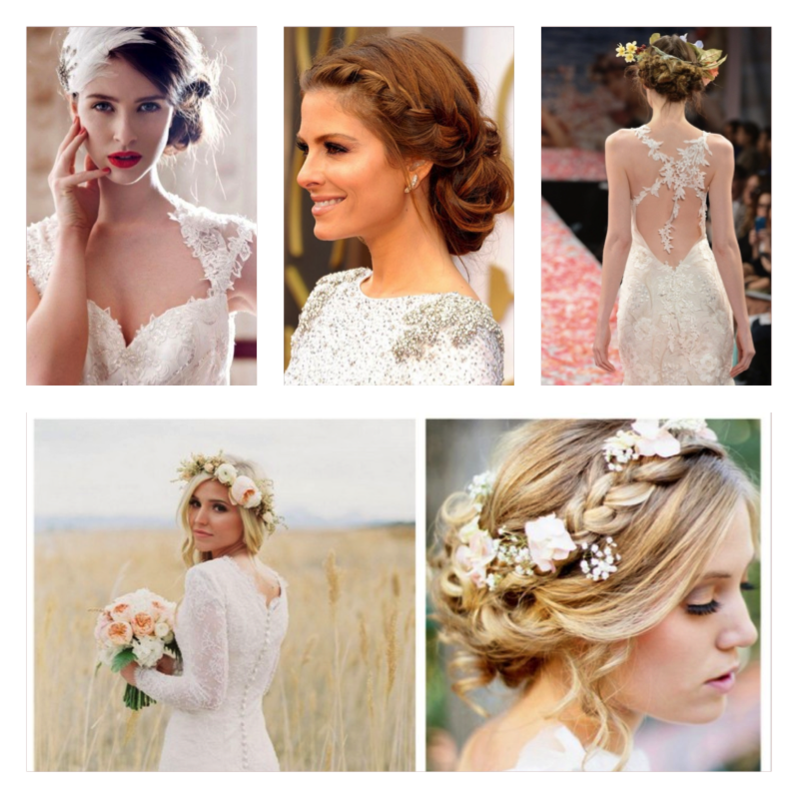 Play around with your looks, find your inspirations and build your beautiful wedding image! You’ve already found the perfect man and the perfect team of stylists to bring your dreams to life! Contact our Salon Coordinator to help you plan everything! See you on your big day!